In March 1881, the Czar of Russia was assassinated by anarchists belong to the movement calling itself “The People’s Way.” That summer, an attempt was made to murder his daughter, Maria, as she rode through Kensington Gardens with her husband, Prince Alfred, the son of Queen Victoria. A Russian Count is found dead in a hospital in London. The anarchists have spread out across Europe and are intent on eliminating their enemies, even those living in London. Scotland Yard and the Home Office arrive at 221B and enlist the help of Sherlock Holmes to track down the killers and stop them. 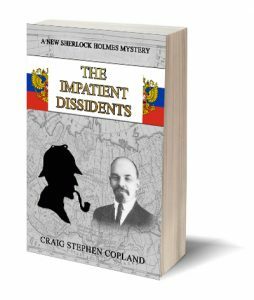 This is Craig Stephen Copland’s latest new mystery pastiche and was inspired by “The Resident Patient.” It is available now from Amazon and soon will be on most other on-line stores.